Gloucester secured a bonus point win at Italian side Zebre to maintain their unbeaten record in pool four. A tight game turned when Zebre winger David Odiete was red-carded for taking out full-back Steve McColl in mid-air when challenging for a high ball. McColl scored Gloucester's first try before Henry Purdy and Charlie Sharples went over in the second-half. England number eight Ben Morgan secured the five-point win before two late replies for the Italians. Zebre had opened the scoring with fly-half Luciano Orquera landing two penalties, but full-back McColl got the Cherry and Whites on the scoresheet after good work by England winger Jonny May. Hook added the extras as well as a penalty as Gloucester began to get on top, but prop Sila Puafisi was yellow carded for retaliating to a punch. 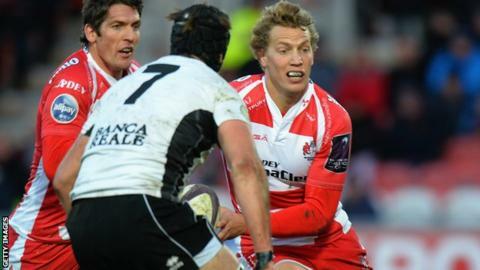 Odiete was sent off for his dangerous challenge just before half-time in Parma, and Gloucester took advantage when a moment of brilliance from captain Billy Twelvetrees set up centre Purdy. Winger Sharples latched onto James Hook's clever pass to cross for a third score, before they secured their third bonus point win in four group games when more good work by Twelvetrees and Hook set up Morgan. Giovanbattista Venditti scored late on after Gloucester's Aleki Lutui was sin binned, and number eight Dries van Schalkwyk also put down from close range for a consolation try for Zebre in the last ten minutes. "We play a contact sport, sometimes players make little misjudgments, and I think Odiete probably made a misjudgment." "We played so well for 60 minutes, we knew we had the bonus point, we felt we had the game won and then maybe subconsciously we relaxed and allowed Zebre to come back into it." "One of the targets we'd set ourselves was, by this stage, to be top of the pool. We are, having got three bonus point wins. We're very much in control of getting a home quarter final." Zebre: Daniller; Venditti, Bergamasco, Pratichetti, Visentin; Orquera, Palazzani; Lovotti, Manici, Chistolini; Biagi, Bortolami (capt); Bernabo, Cristiano, Van Schalkwyk. Replacements: Fabiani, de Marchi, Leibson, Geldenhuys, Sarto, Leonard, Odiete, Haimona. Gloucester: McColl; Sharples, Purdy, Twelvetrees (capt), May; Hook, Braley; Thomas, Hibbard, Puafisi; Savage, Hudson; Evans, Kvesic, Morgan. Replacements: Lutui, Wood, Afoa, Stooke, Moriarty, Robson, Burns, Atkinson.